The couple's Las Vegas wedding was a colorful, 2-day eventful cerebration of their love! We started on Friday with the official henna party, the Mylanchi. A brilliant, colorful Mylanchi party is one of many vibrant celebrations that are part of a traditional Indian pre-wedding celebration. It took place at the Clark County Government building pyramid cafe. On their actual wedding day 450 family members and guests witnessed when they tied the knot at the Christ the King Catholic Church and celebrate with a great party at the Las Vegas Monte Carlo Resort! We started the day at the Monte Carlo Resort with getting ready images. Than we went downstairs where Tina’s family get together, as an indian wedding tradition, the Bride received blessings from the elders in the family. After the ceremony we took some family photos with close relatives in the church, than hopped into the party bus to go to the Springs Preserve , when we had some fun time with the entire bridal party and some intimate moments with the bride and groom. This photograph I created at Springs Preserve during our formal session of my beautiful couple. 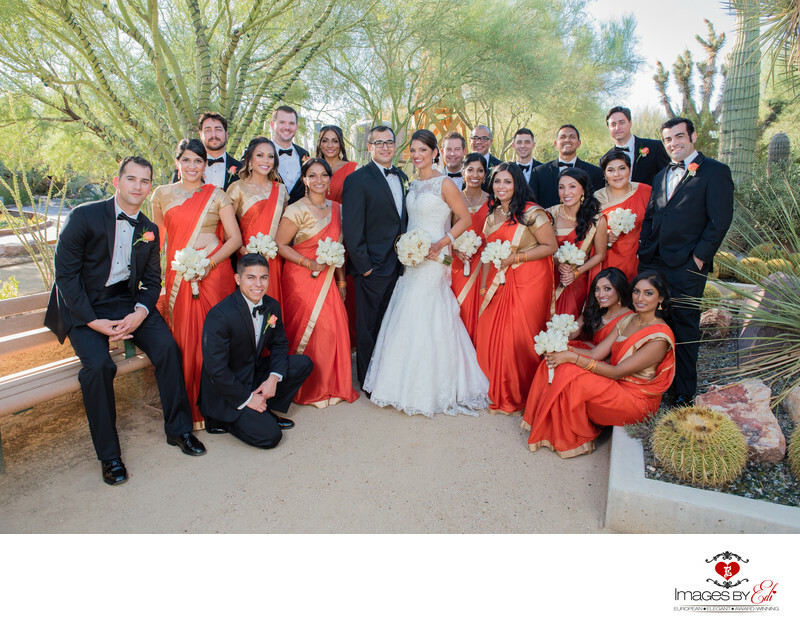 This photograph of the bride and groom with the wedding party, what includes 10 bridesmaids and 10 groomsman. The bride is wearing traditional white dress, while her bridesmaids are wearing the traditional Indian dress in orange and gold colors. Their wedding was in the middle of October, when the Las Vegas weather starts to cool of a little bit. That's why October is part of the very popular Las Vegas wedding season. Location: Springs Preserve, 333 S. Valley View Blvd., Las Vegas, NV 89107.